← What lenses should I buy? Not much on the wide angle side here? So 24mm isn’t wide enough? And remember: I’m using these lenses on my full frame 5D MarkII. 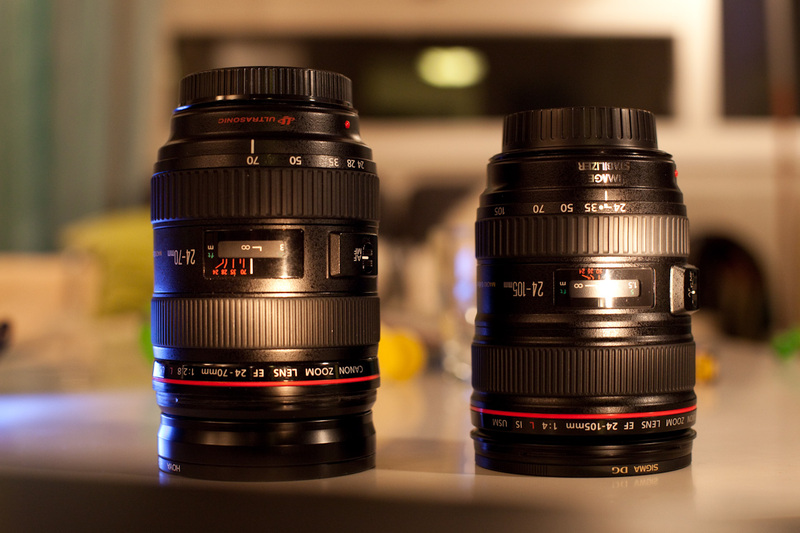 Compared to a 400D, 40D or another 1.6 crop camera the 24mm is equal to a 15mm. So, the 24-105 would equal a 15-65mm on a crop camera. Nice choice. 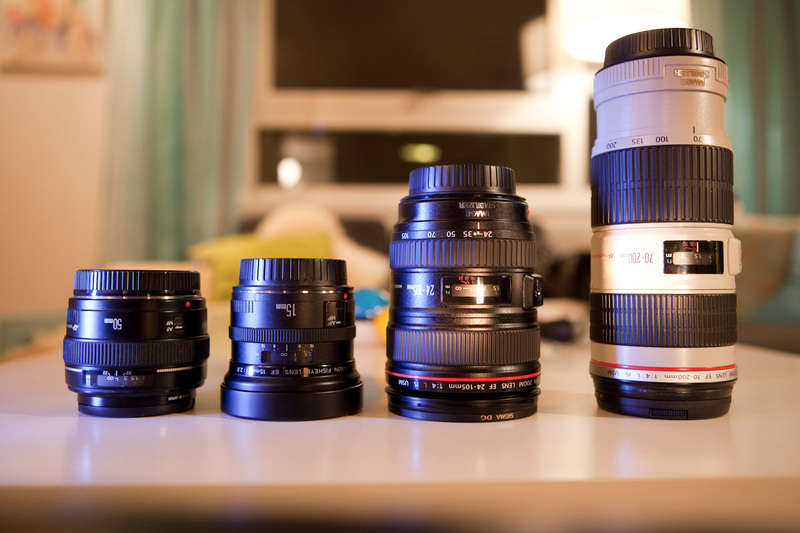 I have the same f4 IS range with the 24-105 and 70-200. Both are great lens and really handy in good light. Side note on the video front. If you don’t have an off-camera mic, I would turn off IS. It is really loud with the internal mic and very annoying for playback. iMovie 09 has the ability to remove some of the motion jitters which is handy if IS is not used. I also find myself using primes for video more so than the above 2 IS off zoom lens due to low light use. The primes I have gone with are the 35/1.4, 85/1.8 and 135/2.0. I got the 35/1.4 initially for an old 1.6x body and it works great on the 5d mk2. I think the 85/1.8 is a great deal and great quality lens. The price difference and AF speed difference between the 2 85mm lens drove my choice vs. any small optical differences. Have recently added the 135/2.0 and have been very happy to have it for low light and outdoor portraits. With these zooms and primes, I can’t justify picking up the 50/1.4 and it is unlikely I would use it much. Also don’t think I would use the heavy 70-200/2.8 much vs. lighter 70-200 f4 and 135/2.0 lens. If the TS-E lens were cheaper, those would be fun to play around with maybe. The only other thing I have been contemplating is the 1.4x extender for the 70-200 and 135 to get a little more reach out of both. I’ve seen other people promoting the 85 mm 1.8 over the 85 mm 1.2… And to be honest I really don’t like the size and weight of the 1.2.
whats up everyone. while doing some lens research, i caught this blog on a google search and i’m lucky i did. it looks like a few here have the kind of set up im working towards and wanted to get some opinions. i bought a 5D Mark II a couple weeks back and just yesterday bought a 70-200 F4 IS L lens (first and only L). I upgraded from an XTi and I’m really enjoying the upgrade. I’m trying to figure out what my next move should be. If I should upgrade either of the two Tamrons to L lenses or buy another high quality prime or two within the focal lengths I’m trying to upgrade? Given my set up, would anyone able to give a good opinion for what my next purchase, if any, should be? Thanks again. Great post and great responses. So far I am very satisfied with the 24-105. The combination of size, reach and the IS makes this very useful. Especially for video work. And I don’t think you need the 50mm f1.4 when you have the 1.8. I would have considered the 80mm f1.8 instead. And, I’m currently considering the 35 mm f1.4L, the 85 mm f1.2L, the 100mm f2.8 Macro and the 135 mm f2L… Can’t decide… But I need at least one more very fast prime for those low light situations. Hei. Storkoser meg med min 24-105 sammen med mitt 50D som er alle tiders. Er ikke noen video mann, men sikler likevel etter 5DMKII, særlig pga egenskapene i lite lys/høy iso. Vesentlig? Skjønner ikke helt…24mmm med crop faktor på 1,6; gir ikke det 15mm omregnet til 35mm? Og hvis du har et fullformat kamera som 5D….er ikke 24mm 24mm? Tenker jeg helt feil her? 24mm blir til 38mm på et kamera med crop faktor 1.6. Så, tenker man i fullframe-format blir 24-105 til 38 – 168 på et kamera med 1.6 crop factor. Nå føler jeg meg litt dum og uerfaren. Tror det var sent i går….jeg har fotografert lenge nok, eksperimentert med objektivers samt undervist i emnet flere ganger. Tenkte helt motsatt. Har forresten storkost meg med foredragene som ligger ute på nrkbeta. Kjørte de 4 fra UIB i ett strekk. Veldig bra! Litt synd med lyden fra salen, men det var jo ikke fleste spm, så det gikk greit. Hehe. Generelt syntes jeg bransjen kunne ha taklet angivelsene for brennvidde bedre enn de har gjort i overgangen til forskjellige brikkestørrelser. Vi har behov for angivelser som forteller oss noe enhetlig om hvor vid eller smal en linse er. Det er komplett uinteressant med korrekte mm-mål i forhold til hundrevis av forskjellige brikker… Jada, matematisk korrekt, men helt ubrukelig for oss. Så jeg har full forståelse for at man kan bli forvirret. the 85mm f/1.2 is not really fast in low light. kind of a pain actually. but FANTASTIC light.